Video: Lance Allred- First Deaf Player in NBA History- Motivational Speaker . Video: Lance Allred Keynote Speaker. Video: TEDxSaltLakeCity: What is your Polygamy? | Lance Allred | . Lance Allred, with his Principles of Perseverance, is the first legally deaf player in NBA history. 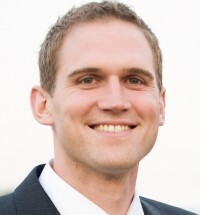 Known as “The Lion,” he is the bestselling author of Longshot: The Adventures of a Deaf Fundamentalist Mormon Kid and His Journey to the NBA (HarperOne). Allred grasps audiences with his powerful presentations on: Leadership, Perseverance and Grit. Standing at 6'11, and born with 80% hearing loss within a polygamist commune before his family escaped when he was 13, Allred has had people all of his life placing limitations on him, but he never listened: he couldn't hear very well anyway. Longshot is a riveting account of a young man finding his purpose and letting the love of the game drive him toward his ultimate goal. Going inside the world of collegiate basketball and the experience of playing professionally in Europe, Allred shares his rise to the NBA with a little push from his agent and a deal with the Idaho Stampede, an NBA Development League team in Boise. Revealing the resilient heart of a young man who truly believes that it's not about failure or success but about being willing to try, Longshot is a Rudy story for a new generation, a tale of inspiration, dedication, and the power of a dream. With a world of stories and setbacks, Allred is a rare breed of motivational speaker: genuine, authentic and customized for your needs. He is a sought after speaker for universities, corporations, sports camps, and community organizations for kids with disabilities across the nation. Perseverance and Grit: How to keep picking yourself up and playing on despite the setbacks. Take Leadership of your own life: Empower yourself with the accountability of choice. Push past your comfort zones: If Allred could day in and day out extend himself physically and mentally beyond his comfort zones, what is your excuse not to? Allred has been featured in Forbes, USA Today and Yahoo Sports for his new Manestream Education Initiative. "Longshot is a must read! It will inspire you and entertain you at the same time." "Longshot is more than a remarkable sports story. It's a reminder of how much can be accomplished when you never give up on a dream." "What an incredible life. Lance's story proves that the trials and tribulations he faced made him stronger." "In a devastatingly honest and poignant book of family, basketball, and life, Lance Allred, the best writing big man ever, mesmerizes with a memoir born of the cruelty and inspiration of a game that could never hold him down." "Lance Allred is excruciatingly hones without ever feeling sorry for himself. His painful and hilarious odyssey is more inspiring and triumphant than the story of any NBA championship. Allred has written The Glass Castle of pro sports." "Hoosiers meets Big Love with a dash of Crime and Punishment. You will never look at an NBA player, particularly those at the end of the bench, the same way again. Making the NBA is like crossing the Grand Canyon on a tightrope; making it as a 27-year-old deaf obsessive-compulsive polygamist's son is walking that tightrope while juggling bowls of hot soup - seemingly impossible, yet Allred did it and shows us how." "An inspiration for anyone who's ever wanted to succeed at anything that appeared out of reach." "If there's a prototypical path to a hoops career, Lance Allred didn't take it. A Mormon raised on a polygamist compound in Montana, the 6'11" Allred was born deaf and has battled obsessive-compulsive disorder. Still, he starred in high school and at Weber State, and last fall he had a preseason stint with the Cavs. He's not an NBA giant, but Allred's memoir is inspiring." "In an ingratiating, self-deprecating style... [Allred's] is a genuinely unlikely story, but he relates it with humor, insight, and compassion." "A Paul Shirley-esque tale of a basketball outsider...a welcome departure from cookie-cutter sports autobiographies." "Allred's voice is humorously self-deprecating and youthfully winning." "The stories of sports figures often focus so much on athletics that only sports fans find them compelling. That is not the case with Lance Allred's book Longshot... Allred's journey to fulfilling [his] dream is extraordinary, not just because of what he accomplished, but because of what he dealt with along the way. The book is much more than a feel-good, you-can-do-it-if-you-try chronicle. It is a gutwrenchingly honest account of a man whose story would be mesmerizing no matter what career path he chose... His story will move you, but it is Allred's decision to find strength in that which hurt and could have destroyed him that will inspire readers most... Ultimately Longshot isn't a book about making a dream reality, as much as it is making life's battles your blessings." "A harrowing and moving look at Allred's life growing... 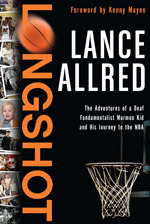 In 250 riveting pages, Allred honestly, breezily, and often hilariously recounts his life... His personal and familial history alone is worth the read..."
"In the land of reclycled and formulaic sports bios, this book by a deaf, fundamentalist Mormon kid is definitely worth a read." "If interesting life experiences are the mark of a good autobiography, then Lance Allred has a good head start."